Brides tend to get very creative when it comes to photos with their bridal parties, but in terms of family wedding photos, they normally keep it traditional. If you want something a bit more dynamic than the formal standing portrait, there are lots of easy ways to switch things up. Use your amazing venue to your advantage, add some props, or try a different camera angle. If you don’t want to veer too far away from tradition, simply switching up the poses can result in much more striking wedding photos. When you try something a bit different, you’ll end up with more personal and fun photos to remember your special day with. Get inspiration from these unique family wedding photos. This creative shot incorporates everyone: your parents, his parents, and your entire bridal party. It’s worth seeking out a unique frame like this one prior to the big day — it makes the photo look that much more stunning. Speak with your photographer about posed portraits, but make it clear you’d like a few candid ones, too. This seated family portrait is less formal than a standing one. Plus, if you're involving little ones in your wedding, it's practically inevitable that they'll have meltdowns at some point – and those unexpected moments are the ones that'll make you laugh later. Stick with the traditional standing set up, but make it more unique by allowing everyone to do their own pose. Make sure you have a good one for yourself. You are the bridal, after all. There will be lots of photos you will want to take with your mom. Try taking a candid group shot with her, your new mother-in-law, and your sister. Who says that all family wedding portraits have to be oh-so-serious? Add some fun into yours with some silly poses. This group made use of a low brick wall by pretending to fall off it. Turn your family wedding portraits into a scene by making the most of your location. This couple and their family made their portrait look like a candid street scene shot, albeit a very stylish one. If either of you already have children, there will undoubtedly be plenty of emotional moments with the kids on your big day. This photo perfectly captures one tender family moment. If you have a big family, it can be tricky trying to get everyone to fit in the frame of the photo. Forget the wide angle lens and take a less formal approach by having people crouch and kneel. Kids will be more than happy to sit in the grass. Simply switching where the photographer stands can create an entirely new effect. The photographer created a more intimate shot by capturing this family holding hands from behind. Your wedding day is all about love — and not just between you and your new spouse. Express that in your photos by sharing a kissing photo with the two of your families. Capturing your family from high up is an easy way to get all of your relatives in. Plus, it gives you a fresh venue shot. If you’re having a destination wedding, work the tropical theme into your photos. This family looked ready to hit the waves — even without surfboards. There are endless combinations you can create with just one photo frame. 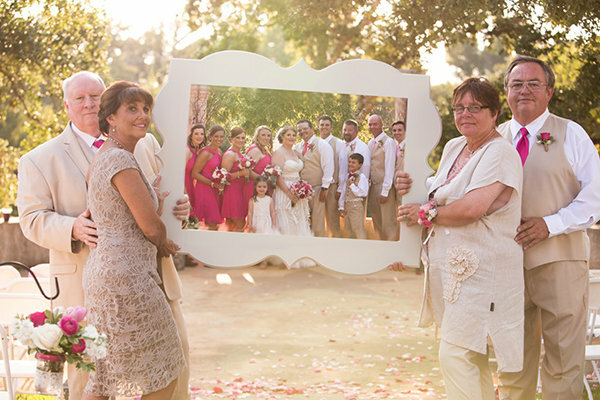 Try having your mother and mother-in-law holding the frame on either side as you and your groom pose in the middle. You get two photos with one look when you’re the focus in one shot, and your mothers are the focus in the other. An action shot is always more compelling than a static one. Have your family toss up multicolored streamers in the air when it comes time for the family portrait session. Emotions will be running high on your wedding morning. Get your photographer to snap a few candid shots of you, your mom and your sisters hugging as you get ready to walk down the aisle. If you don’t want to stray too far from the traditional portrait, try adding in a couch for a more relaxed feel. This stunning white couch and the outdoor setting make for a gorgeous composition. Everyone is going to be swooning over you and your groom kissing, so why not capture it on film? When you look at this photo, you want to say, “Awww,” along with everyone else. Here, it's all about the clever camera angles. The photographer has managed to simultaneously capture the bride and her parents’ proud expressions while remaining hidden from the shot. “Who does the groom belong to? Us!” This is a fun tug of war shot that would work with any number of “teams.” You can try his family versus your family, or male relatives versus female relatives. The majority of family wedding portraits are taken in the daytime. Shooting your photos at night immediately gives them a dreamy feel. Have each family member hold a sparkler for more of a romantic touch. Most of your wedding photos will express love, but have one that says it — literally. These light-up letters create an interesting composition and give the photo a unique light. The cheering poses suit the carefree beach wedding. When you’re traveling between venues, take advantage of the different scenes. This photo of the family walking down the street captures one of the quieter moments of the day. Your photographer is going to be taking lots of pictures, but so will your guests. Combine the two by having your pro photog snap some shots of you and your relatives while they are posing for their own selfies. Ask your relatives to bring their own wedding photos on your big day, then have them hold the pics up during your family portrait. Complete the photo by holding a frame to create you and your groom’s wedding portrait instantly. Everyone wants to catch a glimpse of the happy couple. This clever portrait has the female relatives staring out the window at the bride and groom. Personalize your family wedding photos by working your destination into them. This couple got hitched at the beach, so they asked all of their relatives to be photographed in their sunglasses. Their surprised expressions add to the cuteness of the shot. This informal portrait shows that your family and your groom’s are now one big, happy family with the simple touch of a hand. Rain or shine, these umbrellas make for an interesting composition. Use them to block out rain or streetlight. Incorporate your family members by getting them to hold up the umbrellas for you. In this photo, it is the relatives who are the focus as opposed to the bride and groom. The happy couple is intentionally out of focus, while the teary-eyed family looks on from the window. It can be difficult for little ones to stand still during family portrait sessions, so ask your photographer to take candid shots with them. You know there will be lots of hugging going on during your special day, so be sure to get a few shots of the loving embraces. Who needs a dramatic archway when you have a bridge made up of your nearest and dearest’s hands? This fun low angle shot captures the bride and groom going under everyone’s arms. Is there someone in your wedding party who is just as excited for your wedding day — if not more so — than you? Express that in the photo. The traditional standing photo gets a funny touch thanks to the bridesmaid who is crouching down with an expression of pure glee on her face. Sparklers are popular in wedding shots because they give photos a fairy tale quality. This clever couple had their family spell out “love.” If you have a big family, adjust what you’re going to spell accordingly. It isn’t just your groom who looks at you with eyes full of love. Express this in your photo by having your family gaze adoringly at you as opposed to looking into the camera. Photos-within-photos always make for unique pictures. When you’re using a selfie stick, get your photographer to snap a pic, too. You’ll end up with two completely different photos from one pose. One of the easiest ways to transform a traditional portrait is by adding some movement. Simply having everyone throw their arms up in the air will do the trick. If you opted for a destination wedding, make the most of it in every photo. This family did by posing in lush palm trees for their family wedding portrait. You and your grooms aren’t the only lovebirds. Express this with a photo of your parents kissing behind the beaming couple. It’s your big day, so it only makes sense that you should be the one who stands out in your wedding photos. Express how you are feeling at the moment in your portrait session, like this stoked bride did. At first, this just looks like a traditional family wedding portrait. Then you realize what everyone is smiling so widely about — their blacked-out teeth. Hand gestures can say as much as facial expressions. Let everyone express how they’re feeling with a hand symbol. This bride flashed a peace sign. Some relatives gave thumbs up, while others threw their hands up in excitement. Remember to make sure you take a few special shots with your parents. This lighthearted double kiss shot is a great idea to recreate for your own wedding album. Formal portraits can sometimes feel awkward, so do something fun. This bride showed off her rock to her impressed male relatives. This bride worked her venue into her portraits by having each family member pose with a book from the library. There’s no need for a photo frame, thanks to this cute composition. The kissing couple provides the frame for the relatives in the background. It is hard to say who looks more in love here: the bride and groom, or their parents. A close-up shot like this has more emotion in it than a portrait taken from further back. Your wedding day is definitely something to cheer about. Let loose when it comes time to take your photo with your family. Encourage them to do the same. Look for a location at your venue that will accommodate all of your relatives and make for an attractive composition. This beautiful cottage with wooden porch is the perfect backdrop for an interesting portrait. This is a sweet shot of all three couples kissing. The frame around the bride and groom ensures that the adorable parents don’t steal all of the attention. Hearts, peace signs, thumbs up, team hand signals. They all make for a more relaxed, intimate family portrait. Get your relatives to choose their favorites. However, make sure they keep it clean for at least some of the shots!